This entry was posted in Uncategorized and tagged bark and stride, barkandstridecambridge, cambridge, dog walker, dog walking cambridge, pet sitting on January 22, 2014 by Bark and Stride Cambridge. Bark and Stride now fully insured! House key replacement if I accidentally lose yours! Pets themselves are covered if anything were to happen to them whilst in my care. For everyone’s peace of mind. This entry was posted in Uncategorized on January 16, 2014 by Bark and Stride Cambridge. 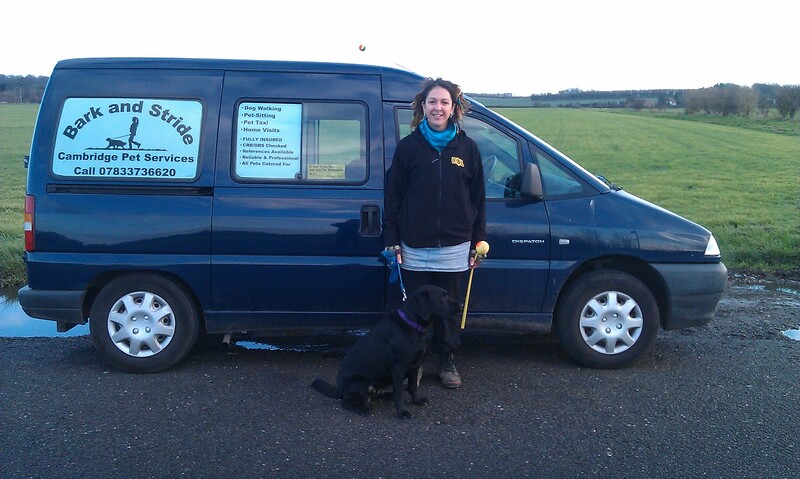 The Bark and Stride van is now officially introduced! With new window stickers installed, and three large crates for safe transportation inside, the Bark and Stride van is now fully up and running. Let’s hope the stickers attract the eyes of prospective customers! This entry was posted in Uncategorized on January 13, 2014 by Bark and Stride Cambridge. Bark and Stride on Facebook! This entry was posted in Uncategorized on January 6, 2014 by Bark and Stride Cambridge. Bark and Stride dog walker, based on Mill Road in central Cambridge travels from Mill Road to Grantchester nearly every weekday, and can drive via Queen Ediths, Newnham, Trumpington or wherever you and your dog are. The Bark and Stride van is equipped with large and comfortable crates with soft bedding to make that exciting journey to the great outdoors a safe and secure one. Each dog is given fresh water after each walk from either a bottle or a bowl and treats too (if their diet allows of course!). We usually go dog walking in Grantchester and Coton, but anywhere open and away from people/roads/residential areas is preferred. Each walk last at least an hour and during this time the dogs get to socialise and play with other dogs, swim (if allowed! ), play games with sticks and balls, get lots of attention and generally have a great time! Regular dogs include Kaylie the Labrador, Django and Maise the Poodles, Sasha the Collie X, Chaos the French Mastiff and Charlie the Bichon Frise. This entry was posted in Dog Walking and tagged bark and stride, cambridge, daily, dog walker, dog walking, dogs, grantchester, newnham, pet services, pet sitting on January 6, 2014 by Bark and Stride Cambridge.